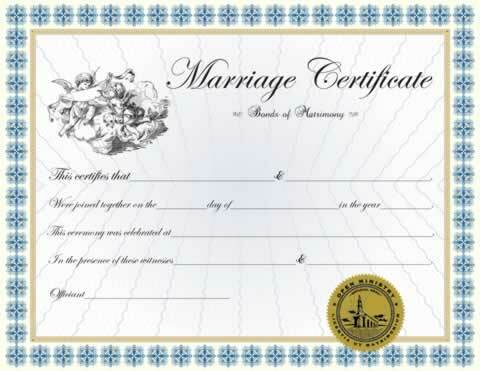 This personalized Classic Marriage Certificate can be pre-printed with names of the couple, date and location of ceremony, names of witnesses and person solemnizing the marriage. Decorated with our gold embossed ministry seal. The custom certificate came out very nicely. I think the couple liked it. Got it for my son and daughter-in-law. Arrived very quickly in the mail, no problems. The certificate I ordered for my brother's wedding was lovely. He and his partner thought it was terrific. I also liked having the ability to order it printed - it looked so much nicer than filling it in by hand. I think the work you do is wonderful. I included a donation when I ordered as a small token of my family's appreciation. It meant a lot to all of us that I could officiate at the ceremony when my brother married his partner. Exactly as I ordered and came in on time! Very beautiful work and the print is beautiful! A wonderful certificate that is absolutely gorgeous. Great quality and makes lovely display as well. The custom certificate is beautiful and looks better with the pre-printed names. Thanks! Better then good, my couple reved about their custom wedding certificate! This has to be the most beautiful certificate! I couldn't have done better myself, and I do Caligraphy. It is an honor for me to give this to the couple!!! I ordered your Marriage Certificate with all the names printed in. The bride & groom loved it!